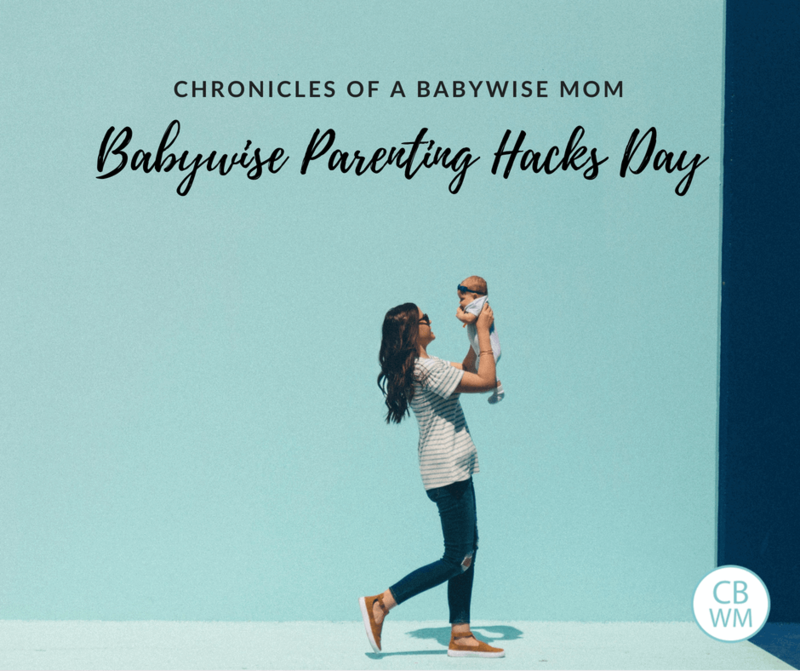 Parenting Hacks from Real Babywise Moms. 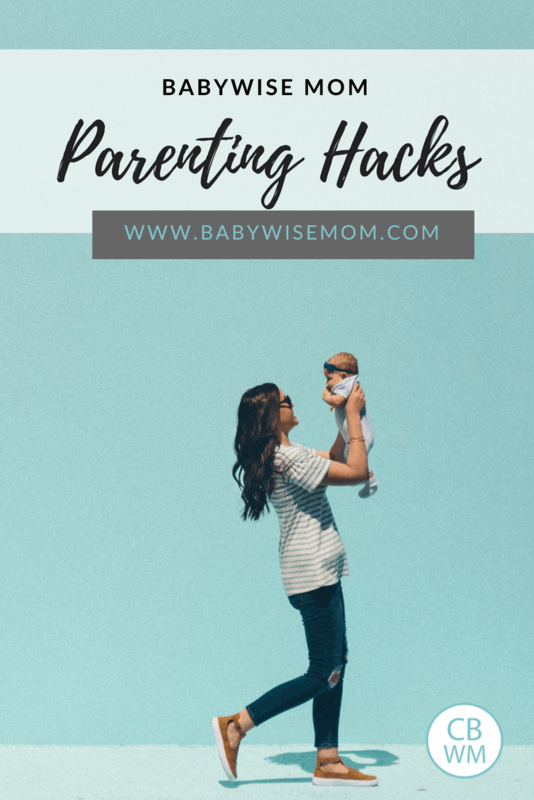 Tips to make parenting life easier. Shopping hacks, medicine hacks, discipline hacks, childcare hacks, sharing hacks, showering and bathing hacks, chore hacks, toy hacks, organizing hacks, travel hacks, and more. Rhianna said: School supply shopping. All 4 school age kids (ages 4-10) carried their own hand basket at the store and put their school supplies in it (some read their own lists, others came to me to ask what next) and then at checkout we bagged it by kid and labeled the names, then it’s already divided by name so i don’t have to sort it. It felt great to keep things divided that way! Brandy said: I just found out children’s Tylenol is the same dosage per 5 mL as infant Tylenol. (160 of acetaminophen per 5 mL) They just put infant in small containers and jack up the price. Kristen said: Baby vicks [for congestion] … a thick layer on the bottom of her feet then cover with socks. It works! Jessica said: Husband told our toddler the story of the 3 little pigs, these three little pigs didn’t listen to mommy and Daddy about how to build a house…yada yada…big bad wolf. You get the idea. So for the past week or so Every time Cooper disobeys or we need to get him to listen, we just say “Big bad wolf!”. Jess said: Great sharing problem solver my sister shared with me! Kid A has a toy that Kid B wants. Kid B asks for a turn and Kid A tells them how many minutes until they can have a turn (at 3yo the max is five minutes). This is GENIUS. Kid A doesn’t feel like they are being “forced” to share and Kid B knows when they will get a turn. We honestly don’t even need to set a timer usually because toddler minutes are so much shorter than real minutes. Angela said: I would use this strategy in my toddler and preschool classes when I worked in day care. Works like a charm! I would narrow it down [for younger children], like say, “Suzy wants a turn when you’re done. Will you be done in two minutes or three minutes?” It will work best when you limit choices, but still gives the child control over when she will be done and she won’t be surprised when the other child has the toy. Pam said: Our master shower bench is full of empty plastic OJ bottles, milk jugs, ketchup bottles, measuring cups, etc. My 2 boys love filling the jugs and pouring them out during the shower!! Let’s me focus on bathing myself and them! Valerie (that’s me) said: We use a handheld showerhead and do a lot of showers with them, also. It is much faster and easier than a bath! Even if my child wants a bath, I wash the child with the handheld sprayer and then fill the tub up. Dana said: My husband runs two businesses and said “if I’m doing all the work, I’m not making any money.” That little tip changed everything. I was running around like a crazy person trying to do everything myself. He told me to delegate. So I did! Now my kids (3yr-7yr) help with dishes, laundry, cleaning tubs and toilets. We take a little time every day and we all work to get things done. It’s been great! Jennifer said: No toys in bedroom either, room together and make a room the playroom. Clean up once a day (at end). When we had a smaller house we used a section of the living room, although i realize not everyone is okay with that decor 😂 we are pretty ocd so it was picked up pretty well. I think it is one of a couple things that saved us from bedtime routine troubles- which outside of maybe 1-2weeks total with all 5 kids, we have never had. Carol said: I did a toddler sensory class for a year with Ds1, and at the end of each session they taught the toddlers to clean up. So even today we say to Ds1 “it’s dinner time, time to clean up” and he’ll put his toys away. So we’ve never had any issues. We live in a 2 bedroom apartment as well and dh is always putting things away and getting Ds1 to help. Then when they are in kindergarten they get to pick a new color of hydroflask and get 2 (which sounds expensive but the oldest has literally used the same two for going on 3 yrs now). Maria said: This is kinda random, but I love using clear page protectors and writing on them with dry erase. I do meal planning, grocery list, “school work” for my 4.5 year old, and cleaning schedule by sticking in a generic form in a page protector and then writing what I need to write and then I can erase it off and use it again. You could also laminate. Tracy suggested you have a child lie on the bed and read books for “independent playtime” while traveling. Susana said: If I find a safe spot (small room without dangers) I try to do it if I find he needs it. I tell grandparents and other people he is doing room time and they have been ok with that. I only do about 30-40 minutes that way. Abby said: Lots of snacks for the 2 yo, movies or shows, books to look at or new little toys to play with. I’d leave right away in the morning and stop for a longish lunch to let the 2 yo burn off some energy, and then hopefully get good naps from both in the afternoon. We just got back from a 17.5 hour road trip (each way) and had a 4.5 yo, 3 yo, 2 yo and 1.5 yo and really only stopped for lunch and maybe one extra potty break. With a baby you will need to stop for her feeding times, but it hopefully won’t add 4 hours on to your trip. Laura said: We did a long ride with our 2 yr old. Went to Dollar Store and got a bunch of little things for her to play with. The equivalent of 1 toy/hour. Also google “car activities for toddlers”. There’s tons of easy ideas that I found supplies for at Dollar Tree as well. Carrie said: I just drove by myself from VA to GA with my 11year old, 8 year old, 5 year old, 2 year old and 8 month old twins. It’s doable. I left at 3 a.m. The little ones all fell back asleep and we drove until our daily wake time of 7:30. Stopped at a restaurant to eat breakfast and for me to feed and diaper change the twins. After that we stop every two hours to get out and snack/stretch. We enjoy listening to books on CD or fun, upbeat children’s music. The twins had their car seat toy to play with and my 2 year old pretty much listened to music or the audiobook or played with a stuffed animal. Honestly, leaving at 3 a.m. Made it totally doable! Rachel said: Movie for the toddler to watch, new $ store toys to play with during the trip, a lunch stop with a play place and my favorite road trip hack- gel window clings of different designs. My little ones love to put them all over the windows during a trip! Beth said: A tag or tag junior pen can seriously help a ton on long car rides. You can find them on eBay pretty cheap. Our DVD player broke 45 min into an 8 hr car ride and amazingly the boys kept busy with books. Which was good. I had no capacity to deal with more given we were on our way home from a month in the NICU with the third.